Today we are announcing the availability of Debian GNU/Linux as an endorsed distribution in the Azure Marketplace in collaboration with credativ. Debian is a free operating system that comes with over 43,000 packages and runs in many architectures and even different kernels. The 64-bit version of Debian GNU/Linux for Intel architecture is one of the most popular Linux distributions in the market, used by developers, governments, enterprises, application architects and derivative developers alike. 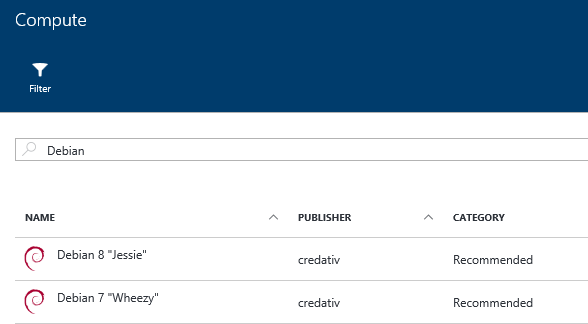 With this announcement, customers are able to provision Debian-based virtual machines in Microsoft Azure by selecting the most up-to-date point versions of Debian 7 (codename “wheezy”) and Debian 8 (codename “jessie”) built by credativ. credativ is an independent consulting and services company founded in 1999 offering comprehensive open source services and technical support and committed to promoting open source software through using, supporting and developing it. credativ has a presence in the UK, Germany, the Netherlands, North America and India. As an endorsed distribution, the Debian images provided in Azure Marketplace are supported by Microsoft Azure’s Linux and open source developer support teams as outlined in our support policy announced in July, 2015. Microsoft and credativ will work together to offer the most updated versions of Debian as Marketplace images, as well as to keep a transparent, community-oriented process for building the images. “We are excited that Debian is now available for all users of Microsoft Azure. In collaboration with Microsoft Azure's Linux and open source developer support teams, credativ and its Open Source Support Centers will partner to bring current and future versions of Debian to Microsoft Azure and act as a liaison between users and community”, said Dr. Michael Meskes, CEO of credativ. A number of Debian releases are already supported by Microsoft in Hyper-V 2012 R2, and with this announcement Microsoft renews its commitment to supporting Debian GNU/Linux across its on-premises and public cloud platforms, including the System Center suite, PowerShell Desired State Configuration (DSC), Azure Site Recovery and the Operations Management Suite. It’s easy to get started with Debian in Azure. Simply select Debian from the Azure Marketplace, or refer to the images in your Azure Resource Manager templates. Don’t have an Azure subscription? Enroll in our 30-day free trial to get started.